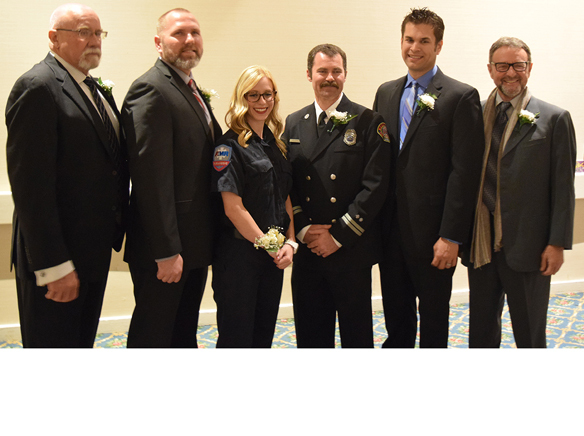 Every year the La Mesa Chamber of Commerce honors those who work in the community of the La Mesa Public Safety services. They save lives, make streets safer, battle the fires and make their own community a better place to live. Now in its 9th year, the Chamber’s Annual Salute to Local Heroes honored six local heroes with a lively evening of conversation, silent auctions, dinner with an “All That Jazz” celebration. In honor of the heroes, the Chamber is donating 25 percent of its silent auction to the Wellness Program—Peer Support. Held at the Town and Country Resort & Convention Center on Feb. 22, the Chamber began getting down to business with La Mesa Mayor Mark Arapostathis swearing in the 2017 La Mesa Chamber of Commerce Board of Directors. President & CEO Mary England said the six heroes being honored were chosen by their individual discipline. American Medical response chose its hero, the La Mesa Police Department chose its heroes. England said the Annual Salute to Local Heroes is a singular event that the Chamber loves to bring to the community by honoring those that protect it. American Medical Response honored Paramedic Elizabeth Robinson. She works in East County serving La Mesa, Lemon Grove and San Miguel. On May 23, 2016, La Mesa Paramedic Unit 255 responded to a 23-year-old man who had been hit by a large sedan while crossing the street. The man was thrown onto the hood into the windshield then thrown to the street and with the head trauma was thrown into seizures. Arriving within three minutes of the call, Robinson and her partner quickly assessed and addressed the life threatening injuries. It was her perseverance in providing advanced life support measures allowing the patient to survive until he reached the hospital. Robinson’s quick and critical decisions saved his life. Robinson said she was honored for the recognition, but more important it is not very often that you know the results of your actions as a paramedic. Knowing that her actions came out with such a positive outcome was all she needed to continue her path in her career in emergency response. Since 2004, Fire Captain William “Billy” Doig has worked with Heartland Fire & Rescue La Mesa. Doig has many responsibilities including the care and maintenance of its safety gear. His involvement in the community includes raising public awareness for the Burn Institute, coordinates the annual La Mesa Firefighters Pancake Breakfast, Fill the Boot Drive and leads the La Mesa team in the annual 9/11 Memorial Stair Climb. Although he has responded to thousands of emergency calls, as a “new” fireman he assisted a mother in the delivery of a baby girl at home. Every year, her parents bring her by the station to say hello to Billy and the other firefighters that responded that day. Doig is the 2016 Fire Department Employee for the year, recognized by his peers and the fire service community. Doig said it is amazing to be recognized by the community and the Chamber. “It’s good for all of the employees here to be recognized for all the things and hard work that they have done for the city and the community. It’s an honor for me. We put a lot of effort and work in what we do. For the community to reach out to us and show us the support is awesome,” he said. LMPD Detective Tim Cook quickly realized that a long-term solution was needed to combat auto theft in East County. He volunteered to be the case agent for the Regional Auto Theft Taskforce Operation Kwik Boost. Utilizing a storefront location, undercover agents purchased stolen vehicles, narcotics and illegal firearms. Its goal to identify, infiltrate and dismantle criminal organizations. His work got the operation working in multiple locations, the safety of personnel. Cook coordinated the takedown involving more than 200 law enforcement officers/agents from the federal, state and local agencies. His work within his department and in conjunction with the other agencies led to the recovery of $1.3 million is stolen cars, firearms, cocaine, methamphetamine, marijuana with 92 identified suspects and 86 arrests. Cook is the La Mesa Police Department 2016 Officer of the Year. Assigned to the East County Regional Gang Task Force, LMPD Detective Jacob “Colt” Wisler is the lead detective since 2014. In 2013 he was convinced at cold case was a victim of gang rivalry shooting between two of the most dangerous and violent gangs in the county. With multiple law enforcement agencies across in California, Arizona, Nevada and the FBI concurrently served nine search and arrest warrants. Three suspects were arrested for murder. It also gained crucial intelligence in the structure of these gangs. His dedication to uphold the rights of all citizens from gang violence, exploitation and his ability to work as a team leader and a multitude of agencies, Wisler is the 2016 La Mesa Police Department Officer of the Quarter for the third quarter. LMPD Retired Senior Volunteer Patrol Mike Sparks joined in 2015 volunteering 1,000 hours to the community and the program. He works two days a week in patrol and volunteers for other community duties Kidz Watch Academy and is a trainer for new RSVP members. With the volunteer coordinator retiring in December 2016 he took on additional duties to make the transitions smooth as possible. Beginning last year, Retired Senior Volunteer Patrol Bill Walton volunteers three to four times a week. His eagerness to volunteer in the community and utilizing his computer literacy skills he took on the responsibilities of updating the RSVP manual, maintains reports and schedules. His additional duties have ensured a smooth transition of the RSVP program. Generally I don’t read article on blogs, however I wish to say that this write-up very pressured me to try and do so!